3 Ways to Take Care of Baby Pimples so as not to get worse - Baby's skin is very sensitive and must adapt to its new environment. For that reason, it's natural for babies to experience frequent skin disorders, for example, acne. Not only teenagers and adults, but acne can also appear in infants. Therefore this condition is called baby acne. Then, how to treat baby's skin with this condition? Consider the following review. Baby acne is initially in the form of red spots which cause the surrounding area to redden if the resilient whiteheads develop. These pimples can appear around the cheeks, chin, forehead, or even on the baby's back. This condition can occur after a new baby is born or about two or four weeks after birth. 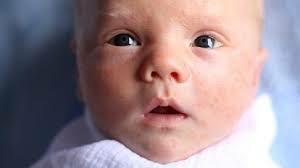 Babies will usually be fussier when rough objects or saliva about the zit. Reporting from the Baby Center, the cause of the emergence of baby acne is not known with certainty. However, this possibility occurs due to hormonal factors and heredity. In addition, if the mother consumes certain drugs while breastfeeding can trigger the growth of baby acne. In some cases, babies can also have this condition as a result of skin reactions to care products that are not suitable for him. 3 Ways to Take Care of Baby Pimples so as not to get worse - This condition is common and can heal on its own in a few days, weeks or months. However, taking care at home can help baby's skin heal faster and make baby's skin healthier. Routinely cleaning the baby's face with warm water helps keep baby's skin clean from leftovers, breast milk, saliva, and of course bacteria or germs. How to clean by preparing a soft cloth or cloth that has been soaked in warm water. Then wipe gently, avoid rubbing the baby's skin hard which can cause irritation. When cleaned, dry it with a towel or dry cloth by gently patting it. Although it aims to clean baby's skin, washing your baby's face is only done once a day and no more. Clean the baby's mouth area that often secretes saliva with a dry tissue. This avoids saliva irritating pimples around the chin. Do not use wet wipes that usually contain alcohol and fragrances that can cause pain and make baby's skin dry. For babies who are still a few months old, using a treatment product is likely to cause irritation. Using oily lotions on the baby's skin will also make the condition worse because the lotion blocks the skin's pores. When you get a skincare product from a doctor, use it as recommended. When pimples appear around the cheeks, avoid pinching his cheeks. This will hurt and irritate the pimples on the skin. For the time being, use buttoned clothes, this avoids the pimpled skin from friction if the shirt is directly used from above the head. In doing skincare for babies with acne, you must be patient. A sense of concern must arise because the baby becomes uncomfortable and often cries. If the baby's pimples don't disappear within three months, you should immediately check the health of his skin to the doctor. Actually, there is no special treatment to cure baby acne. It is likely that the doctor will recommend using medication or ointment as a treatment. Red spots on the baby's skin are also not only a sign of baby acne, but there are also several conditions that cause red spots on the baby's skin and are usually accompanied by other symptoms, such as fever. Perform further checks if these conditions occur.